It is Sunday afternoon, you went to church that morning and you and your family are looking for something to do. If it is between 1910 and 1933, your thoughts would turn to maybe taking a streetcar to Lakewood Park where you and your family could ride the boats on the lake,visit the other attractions or listen to a band in the pavilion located next to the lake. 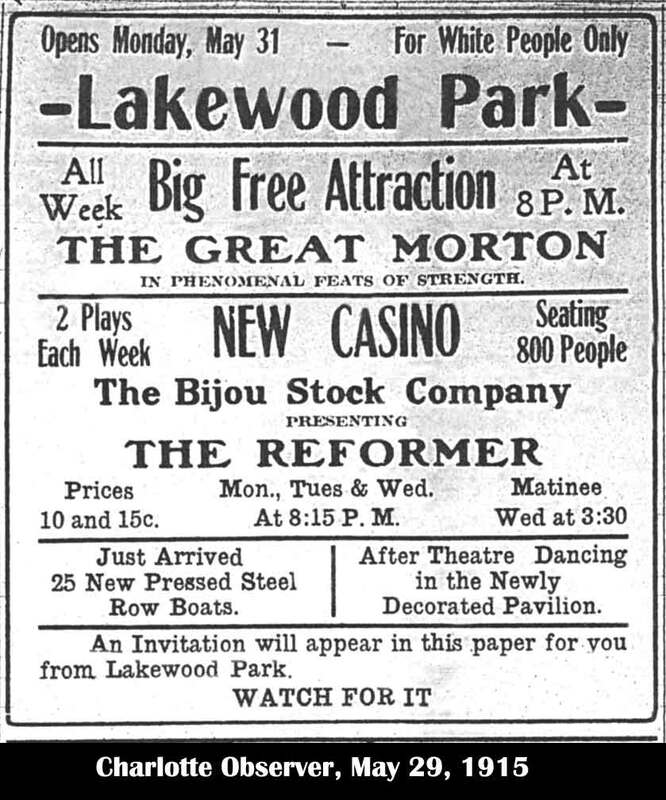 Lakewood Park Ad for May 29 1915. Photo courtesy of the Lakewood Park website. http://www.lakewoodparkcharlotte.com/. This site gives the history of the park with photographs and postcards of the era. The Charlotte Mecklenburg Story at http://www.cmstry.org this site, sponsored by the Charlotte Mecklenburg Public Library is a great resource for local history with images, copies of documents and links to other history sites.